19 Now this was John's testimony when the Jews of Jerusalem sent priests and Levites to ask him who he was. 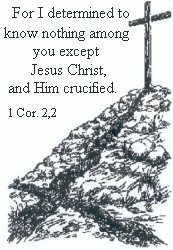 20 He did not fail to confess, but confessed freely, "I am not the Christ." 21 They asked him, "Then who are you? Are you Elijah?" He said, "I am not." "Are you the Prophet?" He answered, "No." 22 Finally they said, "Who are you? Give us an answer to take back to those who sent us. What do you say about yourself?" 23 John replied in the words of Isaiah the prophet, "I am the voice of one calling in the desert, 'Make straight the way for the Lord.' 24 Now some Pharisees who had been sent 25 questioned him, "Why then do you baptize if you are not the Christ, nor Elijah, nor the Prophet?" 26 "I baptize with water," John replied, "but among you stands one you do not know. 27 He is the one who comes after me, the thongs of whose sandals I am not worthy to untie." John was a man, who was sent by God. (John 1:16). There was not any “need for the people,” sight and zeal for things to be right among God’s people or similar things that drove him. It was nothing self-appointed by John and his works at all. He was purely called to this from the time he was in his mother’s womb and then born to live it! Similar to what we also read about Paul (Gal. 1:15) and Jeremiah. (Jer. 1:5). They say this– or it is told about them – but it is just as much about all the other witnesses in the Scripture. It is also about you. You are actually born to live a “program.” “For we are His workmanship, created in Christ Jesus for good works, which God prepared beforehand so that we would walk in them.” (Eph. 2:10). Above all, and over all, that you may be found in Him, not having a righteousness of your own derived from the Law, but that which is through faith in Christ, the righteousness which comes from God on the basis of faith. (Ph. 3:9). But in addition to this, there is a deed he wants to do through you in the world. A lot of the preaching leads to this in our days. No, He simply preaches: “Come to me, so…” And: Abide in My love…” Seek sincere after heart relationship with Him! Or else, you will lose your goal for your life! That is how serious it is. But have you come to Jesus, your salvation will not get lost if you miss this goal; God’s will for your life here on earth. “If any man's work is burned up, he will suffer loss; but he himself will be saved, yet so as through fire.” (1 Cor. 3:15). Always have this in mind considering your salvation; it is built on a different ground than what is happening with you. But the term fire summons that it is something that we should avoid. What would be greater and more joyful for a Christian than to seek a sincere communion with Jesus Himself? Still we so often see that this world’s things and material goods steal His place. Other people have toiled and worked hard on everything they “have to do for Jesus,” as it is called; they are more than eager to have recreation from it all, than to seek a communion with Him. And then you miss your target! For the world, the unsaved, this miss is total! They miss everything God had intended well for them. A man, sent from God, that is what John was. But so are you, as a Christian! A letter from Christ to the world, says the Word. (2 Cor. 3:3). It is also for you this question: “What do you say about yourself?” (v.22b). It has to be both important and interesting to see how this sent man was. You will not find Peter’s pushing boldness, before he was humiliated – nor the shamefulness over his own unworthiness, which paralyses everything – but boldness in the Lord and His grace. What do you say about yourself, my reader? This fetus did not only believe in Jesus, but He also was joyful about the faith. But how can this be, the unbeliever asks rational. Yes, how could God create everything of nothing? Or what will it say to have existed from the eternity on? A simple question for you who so boldly claim - and completely according to God's word - that "anything is possible for God" (Mark 10:27; Luke 18:27), and that "nothing is too difficult for Him": Can He operate faith in an infant's heart? Try at least to be true, and take the consequence of what you actually preach! Faith in Jesus Christ, our Savior, is a gift of God and not what so many believes - the will of man. John was certain that he was sent out by such a Lord. Therefore he did not find so much about himself which was worth talking about. Who are you? That was a natural question for the Pharisees, and not: Who do you represent? Or, who sent you? We know so well this focus on man itself. But a man has in this context, only significance of whom sent him, and in that way he performs the mission of Him whom sent him. His own is not interesting and dangerous to be occupied with. Now they were wondering about whether He was the Messiah! Did they ever think: if He really was the Messiah, how can it be that we do not know Him? That they actually ask is revealing about them. And John says: “But among you stands one you do not know.” (v.26). This was something that made John unique compared to all the previous prophets. They had spoken – often dim – and pointed forward to Him who was to come, but John testifies: “I have seen and I testify that this is the Son of God." (John 1:34). He spoke of one who lived at the same time! John testified about somebody who stood among them, as he is saying in this passage. Look at the Pharisees relationship with God the Messiah – is it Him, or Him? - Compared to for example Simeon and Anna in the temple (Luk. 2:25), who knew Him, as soon as His parents brought Him in. The Holy Ghost was over them! – That was the difference. While Simeon testifies in joy and delight, that he now can leave this world in peace, only because of the child he is holding in his arms. So, they had matted into a net, consisting of hundred of laws and regulations. While Simeon and Anna were God’s children, in wait for the comfort of Israel (Luk. 2:25), the other ones get the description. “You brood of vipers!” (Matthew 3:7). This means the child of the devil. You may have compassion with, pray for and try to testify for brood of vipers, but do not expect anything good or true coming from there. Where are these Pharisees today? Yes, their spiritual relatives are here right in our midst and are persecuting the true Messiah and His called, now as then. These two crowds walk side by side through this world, but they are still as strangers to each other. There is no communion; no understanding that has the same conclusion about the Gospel. There is always strife and discord where these come together. They are not of the same Spirit! Which harmony was there between Gods’ called John and the worshipping Pharisees? Obviously none! The Pharisees had to repent (humiliate) themselves, come down from their high position they had taken themselves and be born again, by faith and cleansing by the blood of the Lamb.